The City Council of Madrid has determined that as of January 1, 2018 all vehicles that are acquired to provide a taxi service, except the Eurotaxi, must be ecological, that is, they will have to be labeled ECO or ZERO emissions from the General Directorate of Traffic. This is one of the points of the modification of the Taxi Ordinance that has initially approved on Thursday 31 August, by the Governing Board. The new Ordinance also includes the free choice of vehicle to provide service by taxi license holders, without prior authorization from the City Council as it has been done so far, provided that they comply with the minimum dimensions and emission limits established, and that it is possible to install the taximeter according to the state and regional regulations. The renewal of the taxi fleet with ecological models is one of the means included in Plan A of Air Quality and Climate Change, initially approved by the City of Madrid, to improve the city’s air quality. Eurotaxis are exempt from the obligation to buy ECO or ZERO vehicles because of the limited commercial value of vehicles adapted for people with reduced mobility. Every year, an average of 2,500 of the 15,723 taxis operating in Madrid are renewed, which will allow a fleet of vehicles with little or no pollution to be achieved possibly as early as 2023. At present, 36.47% of the fleet have an approved ECO label and 0.18% have a ZERO label. According to an article published by El Mundo, more than 10,000 of the existing fleet operates with diesel. Taxis account for 4.9% of the total fleet of Madrid. However, they account for 10.9% of all journeys and cause 9.3% of nitrogen oxides emissions and 8.8% of carbon dioxide emissions of all road traffic in the area of Madrid bound by the M-30 ring road. Also included in the new Ordinance, license holders may choose any vehicle on the market for provision of a taxi service, provided that it meets the minimum dimensions and emission limits established and that it is possible to install a taximeter according to state and regional regulations. The City of Madrid has held meetings with sector organizations to obtain their opinions during the Ordinance development. 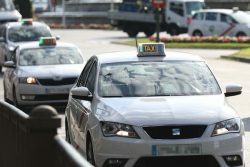 Madrid taxi drivers have been recognised for adapting the sector to offer Madrid users a respectful service with air quality.